The 19th of November is World Toilet Day. While having access to a clean, working toilet is something that most of us take for granted, it is a luxury that many other South Africans don’t have. Did you know that 2.5 billion people worldwide do not have access to functional toilets? And that of these people, just under 1 billion relieve themselves in the open? Did you know that 1.5 million South African children under the age of six don’t have toilets at home? Limpopo is the worst affected province, with just under half of all children without access to a toilet. Why is a Lack of Sanitation is Dangerous? A lack of sanitation leads to the spread of disease. While adults are also negatively affected by this, it is our children who suffer the most due to their lower immune systems and tiny bodies. The most common diseases caused by a lack of toilets are diarrhoeal in nature, such as Cholera. Diarrhoeal diseases result in rapid dehydration and are responsible for killing, on average, 1 000 children around the globe each and every day. 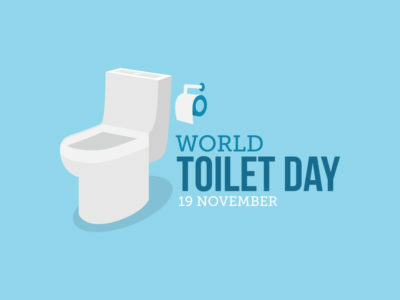 So, what is the aim of World Toilet Day? It is to generate awareness around the issue and to increase the chances of reaching the goal of ensuring that the entire human race has access to clean, safe toilets by the year 2030. This year, the theme is ‘When Nature Calls’ and the focus is on building toilets that also work in harmony with the environment. As an individual, it is up to you to educate yourself on the matter and ‘talk toilets’ with friends, family and colleagues. As a business owner, it is up to you to generate awareness within your organisation. The World Toilet Day website provides an array of resources to help you do this. Resources include posters, logos, fact sheets, artwork and printable guides. You can download them here: http://www.worldtoiletday.info/wtd2018/resources/. Remember – it is also up to you to ensure that you provide your employees with access to safe, functional, clean toilets as well. Copyright © Letsolo Water and Environmental Services CC 2018 All Rights Reserved | All material contained in this website, including all images, articles, and blogs are copyright by Letsolo Water and Environmental Services CC, and may not be duplicated, copied, modified or adapted in any way without our written permission. Our website, including all images, articles, and blogs may contain our service marks or trademarks as well as those of our affiliates or other companies, in the form of words, graphics, and logos. Your use of our website, including all images, articles, and blogs does not constitute any right or license for you to use our service marks or trademarks, without the prior written permission of Letsolo Water and Environmental Services CC. Our Content, as found within our Letsolo Water and Environmental Services CC, is protected under South African copyright regulations. The copying, redistribution, use or publication by you of any such content, is strictly prohibited.